What started this project is that I have a good friend of mine that has a small farm. Well like all of us as we get older some things just do not work as well as we would like. He is getting a little hard of hearing. When he is out at the barn and working outside he can not hear the telephone ring. So I started looking at what it would take to get a set of bells to work. This was going to turn out to be a learning experience for me. We had another friend stop by that day which had worked for the telephone company and was retired. So there was three of us look at this problem. I knew that the telephone company had a voltage on the circuit but did not know much of the details. My telephone company friend explained that that there is about 48 volts DC on the line all of the time and when someone calls to ring the telephone it raises to about 120 vac. So with luck he had a old set of external telephone bells. We took them apart and could see that there was a .47 mf capacitor connect serially to one side of the line going through the coil (that rang these bells) and the other side of the coil was connected to the other side of the line. I though we could use these but they do not ring loud enough. My first thought was that we could substitute the coil for a relay and switch a 120vac line to drive a set of bells like when we were in school. Now those are loud. Well if you think about it, you really do not have enough current to close the relay. So I decided to look on the Internet for some information on some type of circuit that would drive a relay. Arron got the ring detect part of the circuit from http://www.hut.fi/misc/electronics/circuits/telephone_ringer.html. Well I decided to build the circuit but did not want to do point to point wiring. I have been making my own printed circuit boards for a while. But I had not just laid one out from just the schematic. A good friend of mine had turned me on to Corel Draw and that is what I used for my other projects. So without testing the circuit I made the board. Well I ordered the components that I did not have from Mouser Electronics. I also decided to use a solid state relay. One of the notes I read said that is would be more reliable. I had never used one before so I need to pick one for my application. I looked through the Mouser catalog and picked the OMRON Model G3MB. This relay operates at 5 volts DC and can switch 120 volts AC up to 2 amps. I knew that the bells would draw a lot less than that. Guess what? You guessed it. It did not work. So I went into trouble shooting mode and started studying the circuit and taking voltage readings. Looking at the schematic pin 5 of U1 the voltage was low. It should have been reading 5 volts. What was happening is that Q1 was forward bias and pulling the voltage low. I then realized that U1 was not wire correctly. I had found another driver circuit from one of my electronic books. The output of U1 should have been wired as a common collector circuit instead of a common emitter. So I cut the resister R3 from U1 pin 5 and cut the ground from pin 4. I then rewired R3 to U1 pin 4. Now all of the voltage looked good. When the circuit detected a ring pin 5 of U1 would be pulled low (conducting) and the voltage across R3 would start to rise (turning on Q1). This would energize the relay and switch the 120 volts AC operating the bells. 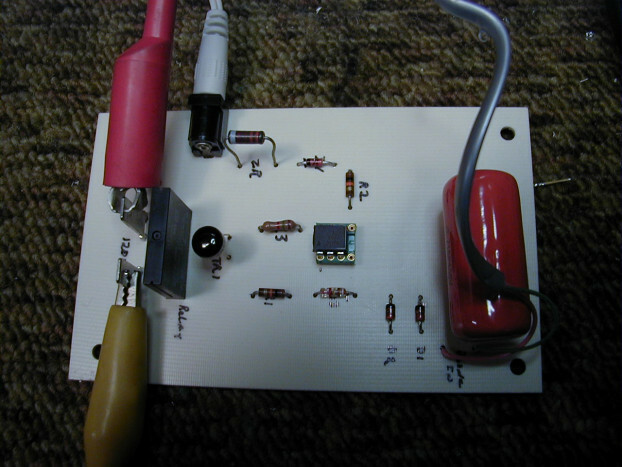 I also made a small 5 volt DC power supply circuit using a zener diode and resistor on the circuit board. This way we could just use a 9 to 12 volt DC wall power supply. This was a fun project and useful. You can also flash 120 volts AC lights. This is how I test the circuit because I did not have the bells to work with. Flashing the lights would be a great way to hear the phone if you are in a noisy shop or hearing impaired.